Spain is wonderful country to visit as a wine travel destination! Spain is most well known for its Tempranillo grape, but there are many important wines being produced in Spain, that the wine connoisseur should now about. 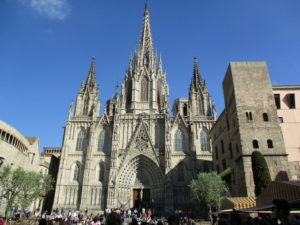 Spain is a beautiful country with diverse landscape which is a beautiful setting for a wine focused vacation. There are some areas of the country that are rugged and arid, and other regions that are lush and floral. Spain used to have a bad reputation for low quality wines, but over the last twenty years much has changed in regards to wine making in Spain. Today there are many high quality wines being produced in Spain. Also, much attention is being given to the organic, all natural wines that are being produced, as I discovered on my last trip to Barcelona, at a wine bar called Bar Brutal, a wine bar totally dedicated to organic and natural wines from around the world. Both Barcelona and Madrid are conveniently located to wine country in Spain. Either city is a fabulous gateway to begin your journey into discovering Spain’s best wines. If you decide to begin your trip in the city of Barcelona, I highly recommend a visit to Bar Brutal. 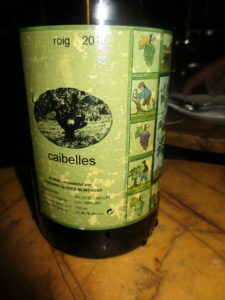 Bar Brutal is wine bar totally dedicated to promoting all organic natural wines from around the world. On my last visit to Bar Brutal, I focused on tasting wines from Spain, but on my next visit I would definitely plan to try some of their other offerings from Italy and France. Not only do they serve delicious, natural wines, but they also offer small plates of gourmet food. 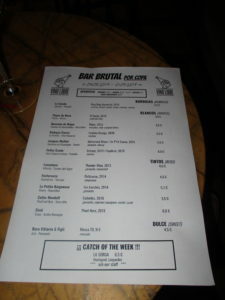 I recently visited Bar Brutal, and I tasted three Spanish organic wines. The first wine I tasted was a Spanish red wine. I paired it with a plate of Spanish olives as my first course. The wine was a very tasty red, and refreshing on a hot Spanish day. It was very fruity and light. It had a very nice finish. It left a light fruit flavor on the tongue. Next, I decided to be daring (for me) and try a white wine. I know it was on odd choice to start with a red and move to a white, but if you read my article entitled, “The Best White Wine I Have Ever Tasted,” You’ll get a better understanding of why I did this. I don’t really recommend starting with a red and then moving to white, I’m honestly just more of a red wine drinker than I am a white wine drinker. I rarely discover a white wine that I really like, so I was hesitant to jump in to my evening with a white that I might not like! But after my adorable waitress really hyping up this white by telling me that, “It’s a white that’s more like a red,” I became intrigued and just had to give it a try. Fast forward to my first sip. My first taste was of course on the tip of my tongue. This white wine reminded me of my beloved Chablis. It was light. It had very little flavor. But it was light weight and light in flavor in an excellent way. Just what I like in a white wine. But then at the finish, it was black pepper! Black pepper! I am not kidding! This was the most unique, unexpected flavor! I took a nibble of green olive. 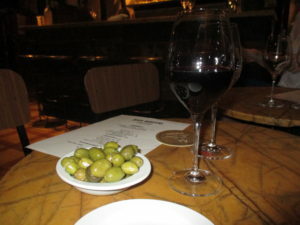 Now mind you, I had thoroughly enjoyed my light, fruity Catalonian red wine with my olives, but the pairing of the green olive with this lightly flavored white wine, with the black pepper finish, this was truly an amazing experience. For my next course, I took the waitresses recommendation and ordered the octopus. It was an amazing dish. 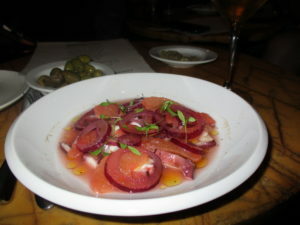 It was slices of octopus with sections of grapefruit and onion slices in a pickle of grapefruit juice. It was delicious alone, but paired with this amazing white wine, with the pepper finish, it was simply divine. 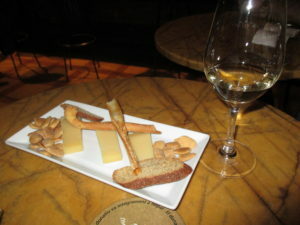 For my next course I was tempted to indulge in something rich, but when I saw a cheese and sherry course, I was thrilled! I love to have a nice ending to my meal without all of the guilt, so I always jump at an opportunity to have a cheese course. 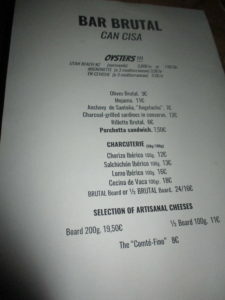 I ordered the comte cheese and sherry. I was pleasantly surprised when it arrived! It included some wonderful almonds and some delicious, crunchy breadsticks! The sherry was unlike any I have ever tried before. Full disclosure, I haven’t had the opportunity to taste that many sherryies on my wine journey thus far, so I will describe my experience as a novice. My first impression was that it was strong! It was of course high in alcohol, as sherries are. It had less of the almond flavor that I have experienced in the past, although on the finish, I could definitely taste a slight hint of almond. It paired amazingly with the comte cheese. I have to tell you this was truly the perfect ending to my evening. I highly recommend if you are ever in Barcelona that you visit Bar Brutal and taste these amazing organic wines. Note: Bar Brutal does not open until 7pm. The light, fruity red wine that I enjoyed was from Cellar Mendall. The unusual white wine was from Cellar Credo Sant Sadurni d’Anola-Penedes Estrany 2013. 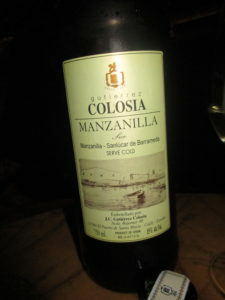 The sherry was Colosia, Manzilla. Let John assist you in choosing a delicious wine to your liking. 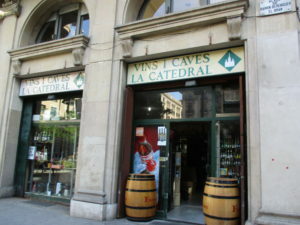 This wine store specializes in Catalonian wines, but they also have wines from the Ribera del Duero region of Spain and other wines from unusual places such as Mallorca.